Soak beans overnight. Prepare according to package directions. In fry pan, brown ground turkey, onion and garlic over medium heat. Put tomatoes and broth into crock pot. Add softened beans. Stir in chili powder, cayenne powder, cumin, basil, salt, and black pepper. Add turkey, onion and garlic mix to the top of the crock pot. Press turkey mix into the juice, but don't stir; the beans should stay toward the bottom of the pot for best softening / cooking. Cook for 4 hours on high (or 6 to 8 hours on low). This is not the most unique chili, but we have tweaked the recipe over the last few years to get the flavor that our family likes. We also like to have it with Honey Cornbread. Enjoy! So sorry for the compete lack of posts lately. My computer has died almost two weeks ago and I don't have nearly the access to publish posts lately. We are still working through the options for replacing my laptop, but in the mean time, I will not be online nearly as much. 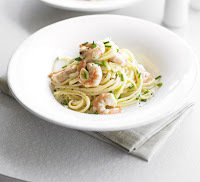 This week we loved the Garlic Linguine with Prawns recipe we had for the first time. We also ended up with a good deal on fresh salmon for Saturday. I didn't have much time, so we just had our fall-back, easy baked Salmon recipe. 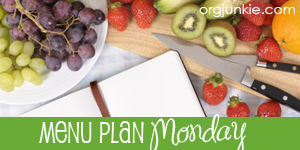 Wednesday -- Lentil Soup - I'm trying a new recipe. I'll share it if it turns out. This is a wonderfully creamy, garlic sauce over linguine and prawns. I tweaked a few different recipes to fit our tastes and to use ingredients we already had on hand. Lower the heat and stir in the crème fraîche and lemon juice. Season to taste with salt and pepper. Simmer for 1 min to reduce a little, then add the prawns and simmer in the sauce until just heated. Drain the pasta and tip into the sauce with half the onions. Use tongs to mix everything together. Serve hot. Sprinkle with the remaining onions.